Early one morning, Farmer Francis set out to feed his turkeys. He was the owner of a tiny little Turkey farm in Burlington, Ontario. He was the poorest man in all the land, but he was happy. He had lots of work to do every day, and most importantly he had to feed his turkeys. When he walked into his tiny little barn he noticed something very strange. One of his turkeys was as flat as a pancake. He thought that perhaps the other turkeys were stealing his food. So Farmer Francis put the flat turkey into a separate room so that he could eat by himself. The next day, Farmer Francis set out again to feed his turkeys. “Gobble, gobble,” replied Mr. Pancake Turkey. Farmer Francis placed twice as much feed in Mr. Pancake Turkey’s feeder, and set out to take care of the other turkeys. He went in to check on Mr. Pancake Turkey to see if he had gained any weight. To Farmer Francis’ dismay, Mr. Pancake Turkey was still flat, but all of the food was gone. “Why aren’t you getting plump?” Farmer Francis said, frustrated. “Gobble, gobble”, replied Mr. Pancake Turkey. Farmer Francis decided to take Mr. Pancake Turkey to the doctor. “My Turkey won’t get plump. Can you help?” pleaded Farmer Francis to the doctor. “Good idea,” replied Farmer Francis. That evening, Farmer Francis brought Mr. Pancake Turkey inside his house to eat with him and his wife. “What on earth are you doing bringing a turkey into the dining room?” bellowed Mrs. Farmer Francis. “He looks as flat as a pancake!” said Mrs. Farmer Francis. Mr. Pancake Turkey ate everything that Mrs. Farmer Francis and Farmer Francis fed him. He ate Baked Beans, Broccoli, Carrots, Squash, Corn on the Cob, and Mashed Potatoes. He ate, and he ate, and he ate and he ate. But he still didn’t get any plumper. Not one little bit. “What am I going to do with you?” asked Farmer Francis. Farmer Francis thought he should take Mr. Pancake Turkey to the zoo. He didn’t have any other animals on his tiny farm, and figured he could show him how other animals lived. He thought he would show him the fattest and plumpest animals, hoping that this would inspire Mr. Pancake Turkey. He showed him the hippos, the elephants, the pigs, and the largest bird in all the land, the Ostrich. “You need to get nice and big, likes these animals.” demanded Farmer Francis. Mr. Pancake Turkey still didn’t get any bigger, so Farmer Francis decided to take him to a Pumpkin Pie Eating contest. They watched as all of the contestants ate as much pumpkin pie as they could, and the person who could eat the most would win a trophy. The biggest man, in all the land, was there, and he ate 15 pumpkin pies. “You need to eat like him” said Farmer Francis. Farmer Francis simply couldn’t win. Mr. Pancake turkey just wouldn’t get any bigger. He didn’t know what to do. 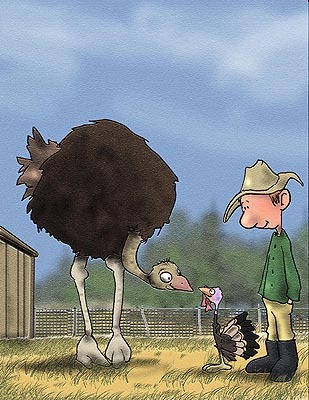 Farmer Francis thought it was a great idea, and decided to take Mr. Pancake Turkey to the circus. Everyone was amazed to see such a strange and peculiar looking turkey, and it wasn’t long before word got out, and people started coming from all over the country to see Farmer Francis’ special turkey. He became the most famous man in all the land. “I’m going to be rich!” chanted Farmer Francis. “Gobble, gobble” replied Mr. Pancake Turkey. Farmer Francis made so much money, that he decided to sell his farm, and all of his turkeys. He began traveling around the country showing everyone how special his flat turkey was. He bought himself a new truck, an airplane, and a boat so that he could go anywhere he pleased. It wasn’t long before Farmer Francis was the wealthiest man in all the land. 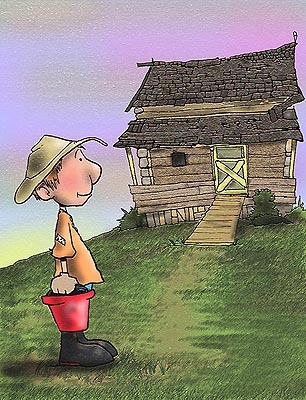 He bought a mansion for Mrs. Farmer Francis, and a big barn, just for his flat turkey. He had everything he could have possibly dreamed. “Yes you do” said Mrs. Farmer Francis. But it wasn’t long before people started growing bored of seeing a flat turkey. Farmer Francis tried desperately to put him on TV shows, or in the movies, or in commercials, but to no avail. He soon had to sell his truck, his airplane and his boat. He could no longer afford to live in the big mansion, so he had to sell that too. He even had to get rid of the big barn. Farmer Francis had nothing. “What am I going to do?” cried Farmer Francis. “I don’t know” said Mrs. Farmer Francis. Farmer Francis realized that he got too greedy. He tried to be somebody he was not. He tried to turn Mr. Pancake Turkey into somebody he was not either. He was a farmer, and that was what he knew how to be. He decided to go back to his little Turkey Farm, and try to start over again. Farmer Francis didn’t need to make Mr. Pancake Turkey plump, and he didn’t need to make lots of money. He just needed to be happy, and being a turkey farmer was what he knew best, and that made him happy. 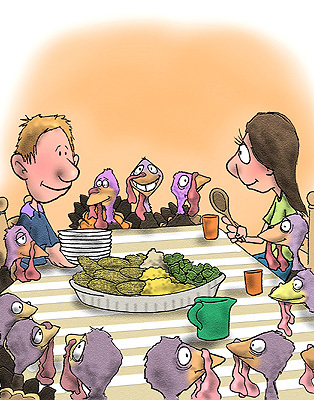 By Thanksgiving Day, Farmer Francis owned his farm again, and instead of having turkey for dinner, he decided to have all the turkeys over for Thanksgiving dinner. “This is best Thanksgiving ever!” sang Farmer Francis. “Yes it is” replied Mrs. Farmer Francis. I am in 10th grade. We read this for my advanced language arts class. What is America coming to?!?! This story was very moving. It was great story and little funny. that is cute! thats a great way to teach kids to always be themselves and not what someonelse wants you to be. I loved |Farmer Francis and his adventure with his pancake turkey. Cute, funny and an awesome message. super illustrations!!! Becoming acquainted with Mr. Pancake Turkey was fun at first even though I felt sad for him. The farmer turned the negative into a positive until he went a little too far. The moral of the story is one that can be discussed in a classroom or around the dinner table with kids as they learn and grow. The story of Mr. Pancake Turkey can be used as a concrete example of what can happen if one is not careful. Spectacular illustrations, fun for all ages! My kids loved the story, especially the part about Farmer Francis buying the big barn for Mr. Pancake Turkey. A great lesson too! Great life lesson with a touch of humour. Love the illustrations and my kids loved it too! Gobble, Gobble. 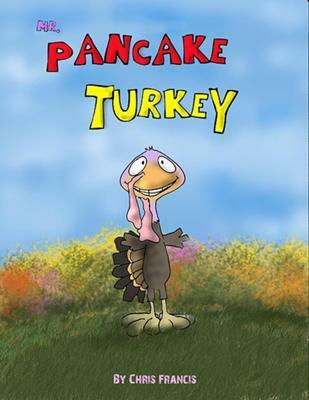 Mr. Pancake Turkey is an adorable story for children. It's entertaining with a great moral to it as well. Perfect for the upcoming season too. This is an excellent story with a great lesson! I felt like I could picture the whole scene in my mind, as the author has a amazingly creative way of captivating the reader's attention. Loved this story...amazing job and great illustrations!